Examples, solutions, videos, worksheets, and activities to help students learn fact families or family of number sentences in Singapore Math. The following diagram shows some examples of the addition subtraction fact families. 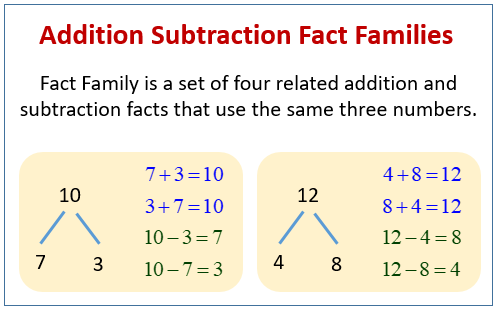 Scroll down the page for more examples and solutions using the addition subtraction fact families. How to create fact families of number sentences?